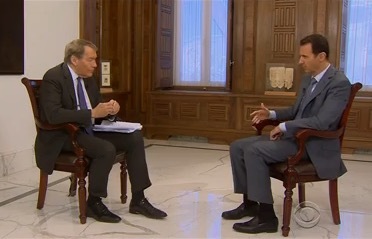 Rose then asked why Assad doesn’t allow inspectors to come in to determine that these weapson aren’t being used. His response included a line that has its origins in local TV news, when the newscasts became a recap of the nightly police blotter. We always ask a delegation, impartial delegation to come and investigate. But I mean logically and realistically [chlorine gas] cannot be used as a military. This is part of the propaganda because, as you know, in the media when it bleeds it leads. And they always look for something that bleeds, which is the chlorine gas and the barrel bombs.